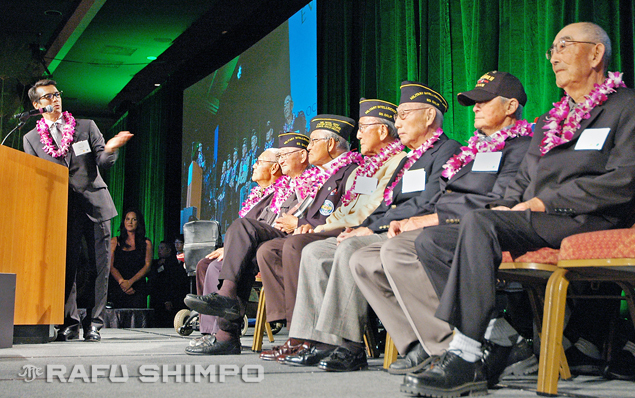 Emcee David Ono welcomes Nisei World War II veterans to the stage. “Ika wa ma mua, ka wa ma hope” — “Embracing the past to navigate the future” was the theme of the 12th annual Evening of Aloha held by the Go For Broke National Education on Oct. 12 at the Westin Bonaventure Hotel & Suites in Los Angeles with more than 800 people attending. Speakers at the gala stressed the importance of preserving the stories of the Nisei veterans of World War II so that even after they are gone, future generations will be able to hear about those experiences first-hand through GFBNEC’s oral history interviews. With ABC7 news anchor David Ono again serving as emcee, the program began with a procession of veterans of the 100th Infantry Battalion, 442nd Regimental Combat Team, 522nd Field Artillery Battalion, 232nd Combat Engineer Company, and Military Intelligence Service onto the stage. The Army Reserve’s100th Battalion 442nd Infantry Regiment Color Guard had been scheduled to post the colors, but was unable to make the trip from Hawaii due to the federal shutdown. The LAPD Honor Guard filled in for them. The national anthem was sung by Lauren Kinkade. GFBNEC President Don Nose introduced the winners of the organization’s first-ever essay contest for high school and college students, Sean Segundo and Andrew Kai Wang, both from Hawaii, and Martha Anna Castro from Oakland. The goal of the contest is to ensure that “the next generation of leaders actually understand the importance of preserving and perpetuating the Nisei World War II experience,” Nose explained. A total of 15 essay-writers were present. Dinner attendees each received a booklet containing all of the essays submitted. Nose listed some of the highlights of the past year, including Japanese American Community Night with the Dodgers, during which veterans James Ogawa (100th), Don Seki (442nd), and Hitoshi Sameshima (MIS) threw out the first pitches, and a celebration of the 70th anniversary of the formation of the 100th/442nd. 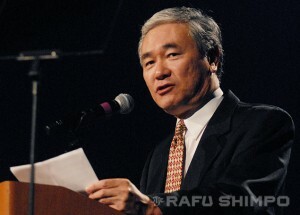 He announced that GFBNEC will begin interviewing Nisei veterans of the Korean War, is taking steps to address the ongoing problem of vandalism at the Go For Broke Monument, and is in serious discussions to move its offices from Torrance to the Japanese American National Museum’s historic building in Little Tokyo next year. JANM CEO Greg Kimura said that the two organizations have been getting “closer and closer together” working on joint projects such as this year’s Congressional Gold Medal exhibit at the museum. Other speakers included Steve Morikawa, dinner chair and assistant vice president at American Honda Motor Co., and GFBNEC Chairman Bill Seki. The Grateful Crane Ensemble did a presentation about the Gothic Line, a battle in which the 442nd climbed up a long, steep, vertical mountain at night to attack a German stronghold. While videos of veterans who took part in that battle were shown, ensemble members used a shadowbox to act out the story. 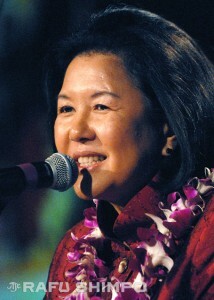 Irene Hirano Inouye speaking on behalf of her late husband, Sen. Daniel Inouye. The names of Japanese American veterans who have died in the past year were shown on a screen, and there was a special tribute to one of them, Sen. Daniel Inouye of Hawaii. Following a presentation by students Scott Shima and April Nishinaka on Inouye’s life, Irene Hirano Inouye, his widow, spoke on his behalf. 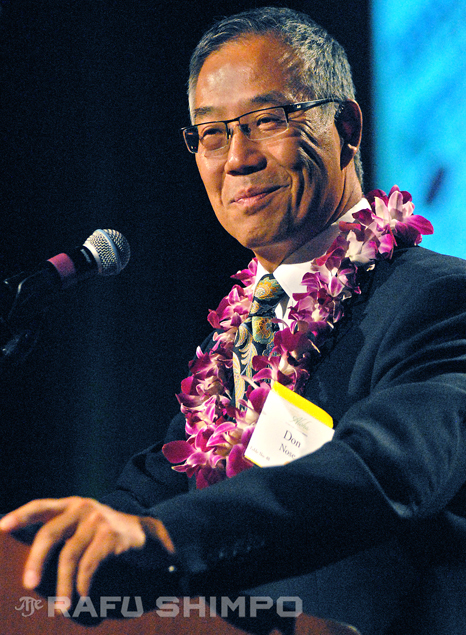 “Dan attended this dinner over the years and he always enjoyed … (meeting) his good friends Manabi Hirasaki and George Aratani, whom we also lost in this past year, two people who have continued with their families to ensure the support of many organizations,” Hirano Inouye said. “Dan always enjoyed attending the 442 and veterans’ events … It was only because of business in Washington, D.C. that he was prevented from participating. 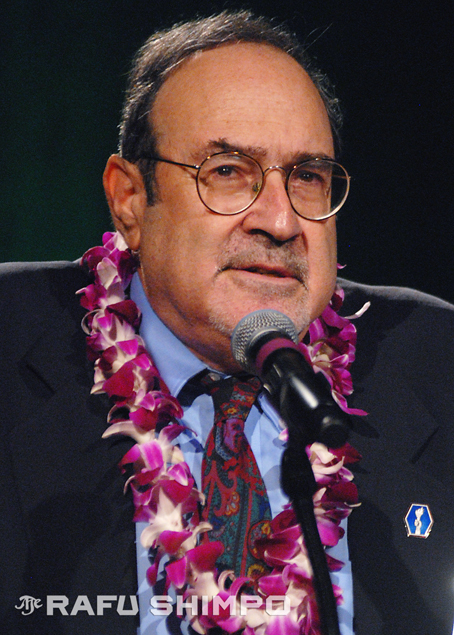 Noting that the senator has received many posthumous accolades in the last few months, his wife emphasized, “Dan would only feel good about the tributes and the honors that have been bestowed upon him if it meant that the values and the lessons of his life and that of others who served with him were always remembered … If Dan were here this evening, I know that he would say that we have a legacy of values that must be continued. For him it was about duty and honor. He like so many Nisei were very humble and grateful for what their parents had sacrificed for them. Referring to the congressional stalemate, Ono remarked that Inouye always showed “statesmanship” and willingness to “work across the aisle” with his Republican colleagues. The evening’s attendees received DVDs of “Journey to Washington,” a documentary about Inouye produced by Fujisankei Communications and sponsored by Nitto Tires. Saul interviewed 40 vets in Hawaii and on the West Coast and found them to be “humble, quiet, and unassuming … At first it was very difficult to get you to talk about your war experiences … You told me that you didn’t want to brag.” It was then that he learned about such Japanese values as enryo (holding back), on (repaying a debt), gaman (perseverance), meiyo (honor), kansha (gratitude), oyakoko (duty to one’s parents), and kodomo no tame ni (for the sake of the children). He compared GFBNEC’s collection of 1,550 oral histories to a project launched in the mid-1930s to record oral histories of the few former slaves still living. That collection is now housed in the Library of Congress. Darrell Kunitomi of the Grateful Crane Ensemble tells the story of the Gothic Line. Author and CSU Dominguez Hills dean Mitch Maki led the “Rally the Troops” segment, in which donations for the preservation campaign were solicited. He reiterated the fact that Nisei vets are being lost every day, citing the recent passing of his father, who served in the Korean War and was awarded the Silver Star. Together with pledges from the Aratani Foundation, Union Bank and others, GFBNEC reached its fundraising goal of $100,000 that evening. In addition to a silent auction and a live auction, there was an opportunity drawing with the grand prize, a 2013 Honda Accord V6 touring sedan, going to Beverly Yamagata. The chefs for the evening were Roy Yamaguchi (an old friend of Sen. Inouye) of Roy’s Restaurants Worldwide, Jackie Lau of Roy’s Restaurants Hawaii, Akira Hirose of Maison Akira, and Andreas Nieto and Jose Velasquez of the Westin Bonaventure. 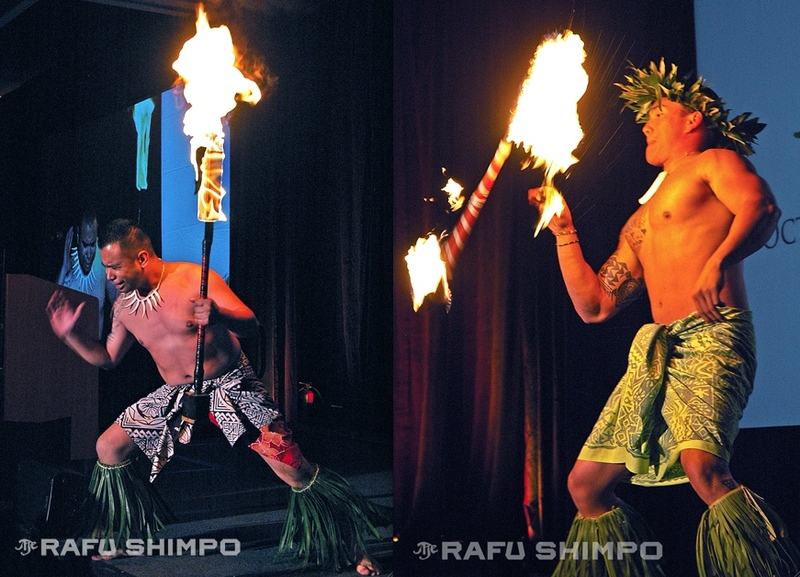 Alika Soriano and Ikaika Villapania of the Polynesian Paradise Dancers. 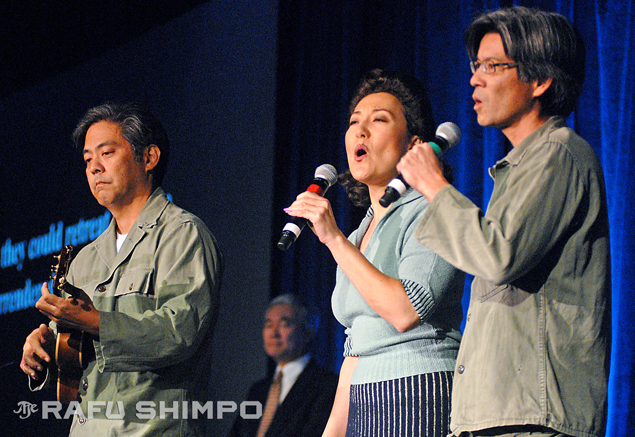 From left: Kurt Kuniyoshi, Keiko Kawashima and Shaun Shimoda of the Grateful Crane Ensemble. Left: Emcee David Ono of ABC7 Eyewitness News. Right: Junko Tadaka of Polynesian Paradise Dancers.